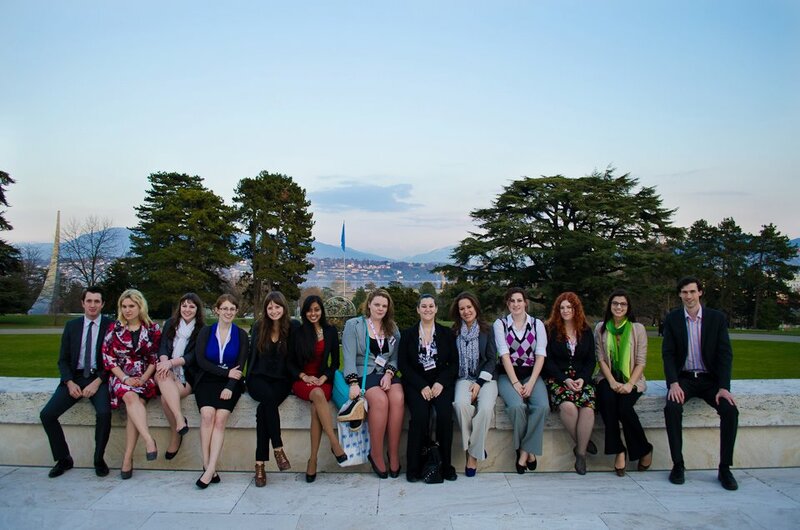 The Pace University New York City Model United Nations delegation to the 2012 Geneva International Model UN conference, in the gardens of the UN Palais des Nations. Left to right: Michael Zona '13, Katie James '14, Elena Marmo '15, Cassandra Stimpson '13, Abby Lee '13, Krupa Patel '12, Asia McDougle-Stamey '13, Amanda Corsaro '12, Aydde Martinez '07, Miranda Ronghi '12, Jean Dorak '13, Kimberly Alonso '13 and Dr. Matthew Bolton . Photo by Francis Mayne for GIMUN. Educating for global citizenship is one of Pace University‘s top priorities. 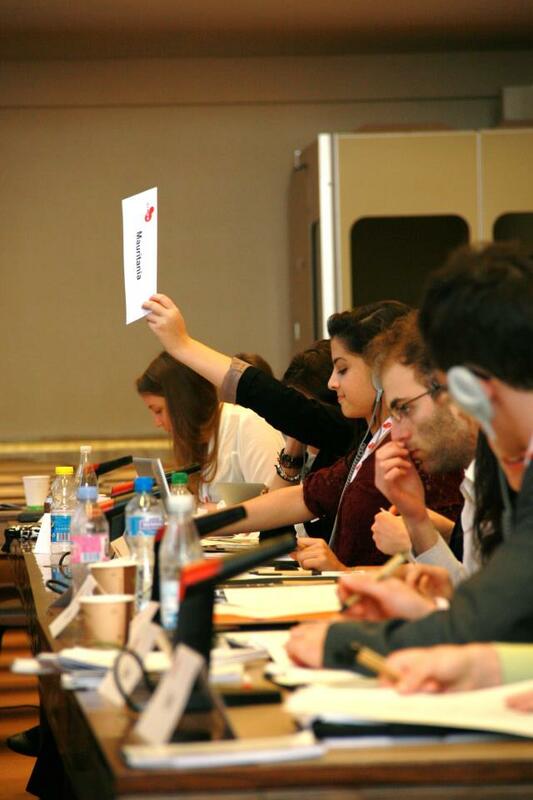 At the Geneva International Model United Nations (GIMUN) conference in Switzerland last week, Pace students explored what it might mean to be a global citizen in the auspicious committee rooms of the Palais des Nations – former League of Nations headquarters and current location of the UN Office at Geneva. The Pace University New York City delegation won three awards for its dedicated engagement in discussions on key contemporary issues of conflict, aid, human rights and eradicating poverty. The GIMUN conference mirrored its 2012 theme of “Achieving Dialogue and Development through Cultural Diversity.” Participants hailed from 49 countries and committee sessions were simultaneously translated between French and English. For more information on GIMUN, read this interview with Nicolas Vetterli, president of GIMUN. Kimberly Alonso '13 (center) listens to simultaneous interpretation of the proceedings of the UN Development Programme committee at the 2012 Geneva International Model UN conference. Also in her committee were Abby Lee ’13, who represented Sweden and Kimberly Alonso ’13, representing Japan. To learn more about Katie, Abby and Kimberly’s work at the conference, click here. They considered issues of poverty and development, a topic which was also examined from a financial perspective in the conference’s Economic and Social Council (ECOSOC), where Cassandra Stimpson ’13 and Elena Marmo ’15 were both recognized with “Special Mention” awards. For more on Cassandra and Elena’s award-winning contributions to the conference, click here. 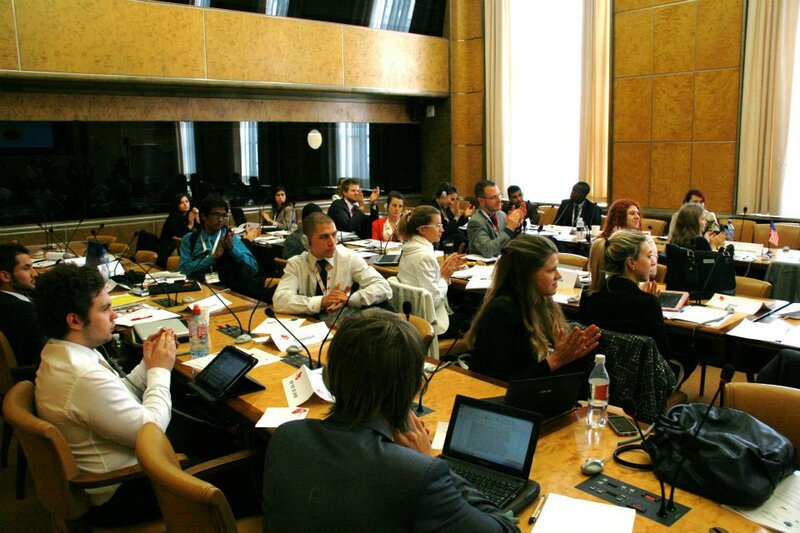 Delegates in the Human Rights Council, including Jean Dorak '13 (middle row, second from right), applaud progress in their deliberations at the 2012 Geneva International Model United Nations. Issues of international law were also central to the work of Jean Dorak ’13, who represented Jordan in the GIMUN’s Human Rights Council (HRC) and head delegate Amanda Corsaro who represented Togo in the Security Council. To learn more about Krupa, Jean and Amanda’s work at the conference, click here. Model UN teaches one to see “Being put in the middle of two diametrically opposed sides” as an opportunity “to bridge the divide and to play consensus builder,” said head delegate Michael Zona ’13, who represented India in discussions on religious freedom and the rights of indigenous people in a simulation of the United Nations Social, Cultural and Humanitarian (SOCHUM) committee. Also in his committee were Miranda Ronghi ’12 — who was recognized with a “Special Mention” award for her representation of Peru — and Asia McDougle Stamey, who represented Indonesia. To learn more about Michael, Miranda and Asia’s work at the conference, click here. Dr. Matthew Bolton, Pace University's New York City Model United Nations adviser talks strategy with head delegate Katie James '14, in the plaza outside the UN's Palais des Nations in Geneva. In recent years the program has won recognition at prestigious conferences for the team’s ability to cogently analyze complex global issues, engage articulately in policy debate and propose compelling solutions. In 2011, the team took home the most awards (tied with another university) from the North American Model UN conference in Toronto, as well as the most awards from the National Model UN (NMUN) conference in Washington DC. Next week (1-5 April), students in the program will participate in the NMUN conference here in New York City.